Big Bend is talked about more than any other park in Texas, so we finally decided to give it a go. Due to the time of the year, we knew the amount of water in the desert park would minimal. They recommend you bring one gallon of water per 24 hours in the park. 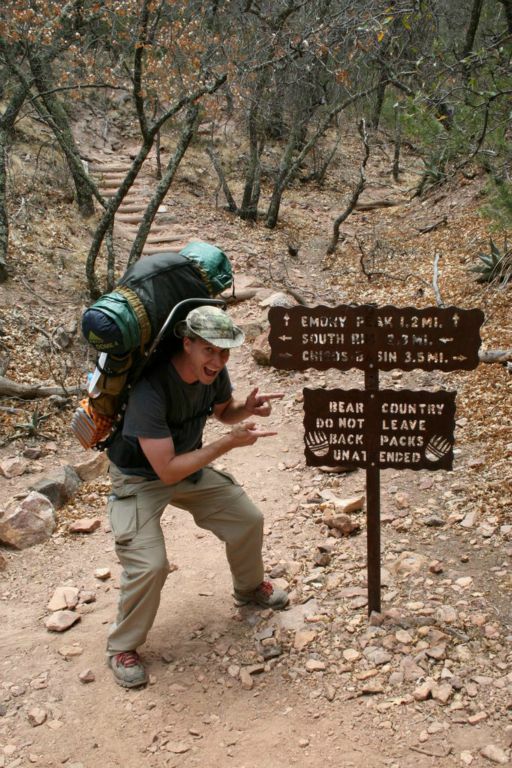 Since we planned to camp in the Chisos mountains nearly 2,000 feet above the parking lot, the plan was to only bring 1.5 gallons each. We left for the park about nine Saturday morning and made the trip in about 7.5 hours... better than expected. 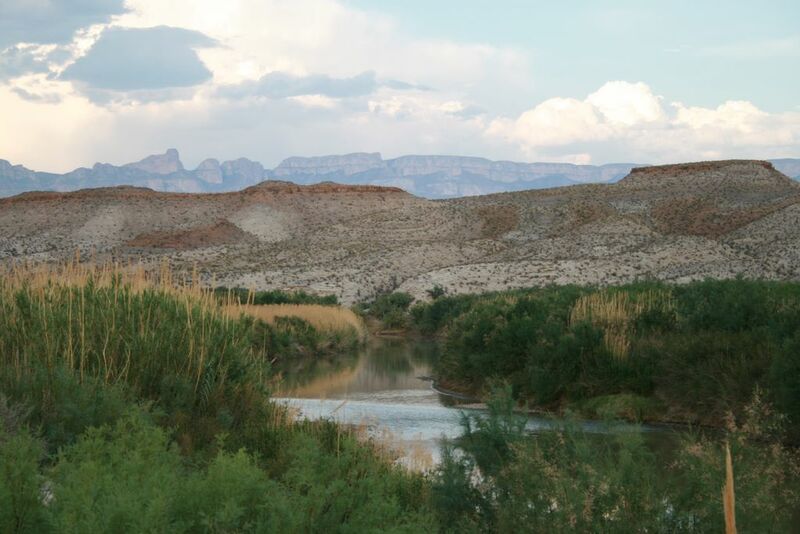 Since we got in around 5, the plan was to roadside camp for the first night in the desert, hike into the mountains for two nights, and spend the final night near the Rio Grande . That was the plan anyway. We found a nice spot near Pine Canyon, set up camp and started to cook up some dinner. Dale was telling me how he liked hotdogs made the traditional style (lips and assholes) over my soy dogs when we noticed the tent was being blown away. It tumbled over a couple of times and was finally caught by an prickly plant we call a "razor bush". We pulled it out of the plant's clutches and returned it to its original location, this time with tent stakes. The tent stayed but the wind never did die down. 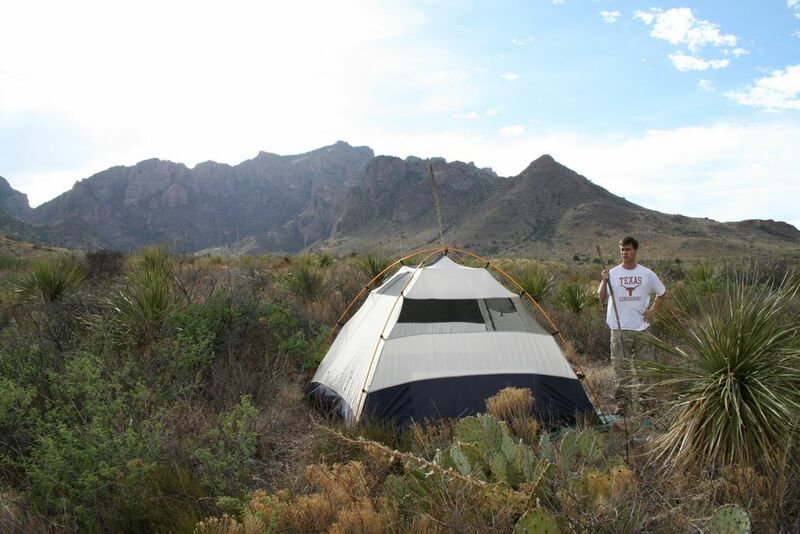 The next morning, it was early to rise, pack up the gear and head towards the Chisos Basin. By 10am, we were on our way towards the top. With the extra water weight, the plan was to hike a bit, take a break, repeat. And repeat a few hundred more times. Along the way, we spotted a little variety of wildlife, mainly deer and birds. There was one fat little blue bird that damn near landed on our packs and demanded food. I was able to get about three feet away and snap a few photos before I scared him off. We continued up the mountain and actually made decent time. 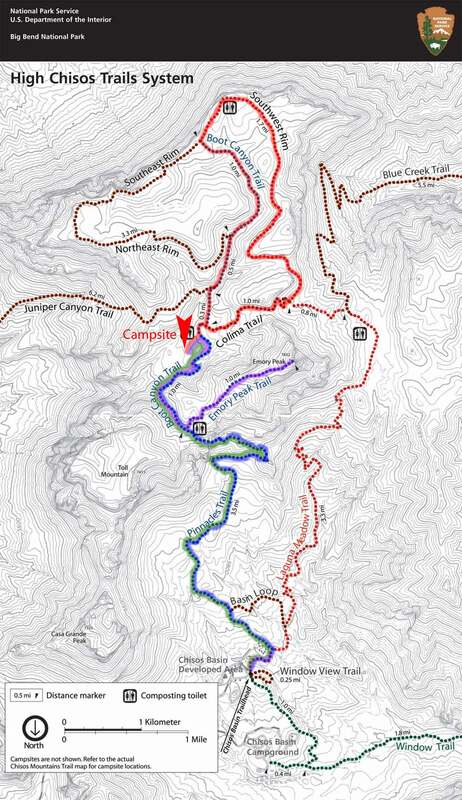 It took about three hours to get to the camp site six miles away. We set up camp and took a load off. After some time to relax, we made a trek down to where the watering hole was supposed to be. Once we got there, we found two puddles, a green one and a brown one. Neither was more than about a gallon or two each, and there was no way either of us were going to drink it. Plus, I would have felt guilty for taking the water from the animals. Dale: "It's all downhill from here." Mark: (Looking at the trail that starts by heading up) "Umm, it doesn't look that way." Dale: "Let me rephrase that. There are a lot of switchbacks." Much to our dismay, the trail wasn't downhill. 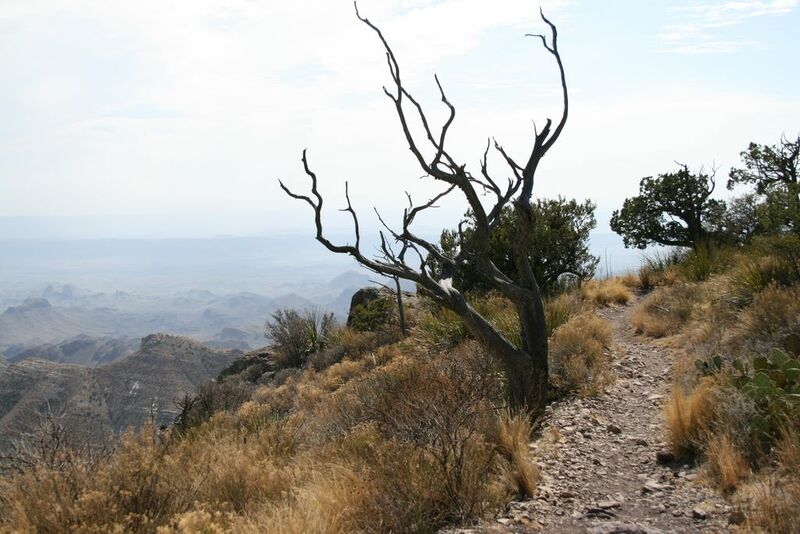 Next up was Emory Peak, the highest point in Big Bend. 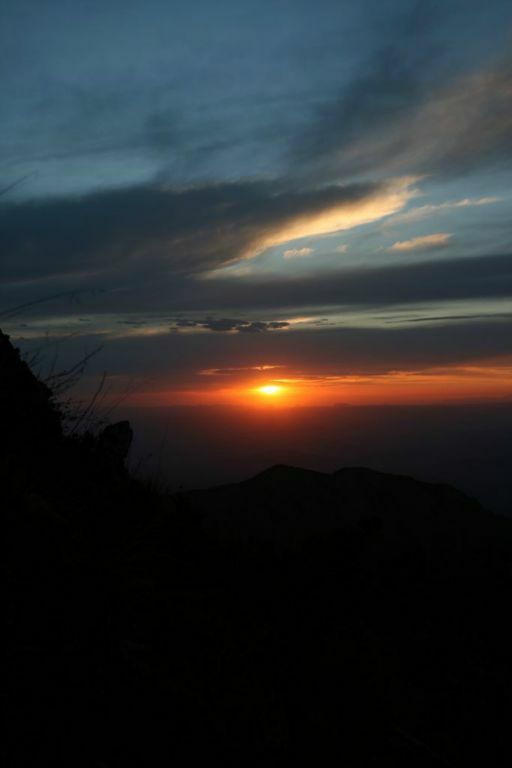 The plan was to climb to the top, watch the sunset over the park, and head back down using flashlights. The way up proved to be a quite a challenge. 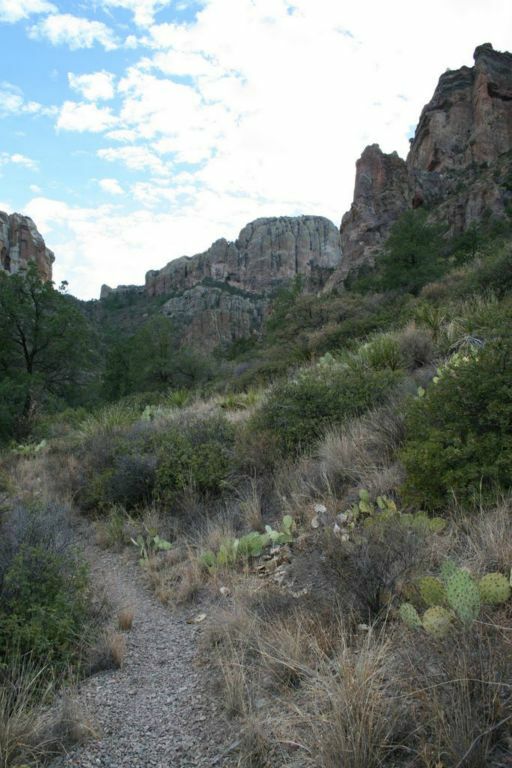 The top of the trail finishes with several hundred feet of switchbacks followed by a 30 foot climb up a steep rock face. We got near the top of the rock face as the sun was starting to set. Realizing that climbing down using flashlights might prove to be a bad choice, we instead opted for a spot about 50 feet lower with pretty decent views as well. After the sun was down, I got to use my new geeky headlamp flashlight as we descended the peak. Once we got back to the camp, we were pretty tired from 15+ miles that day. I woke up shortly after sunrise. After trying to conserve water for the last 24 hours, we were ready to get back to the easy accessibility of the water sitting in the cooler in the jeep. We headed back down the mountain and encountered several friendly and optimistic hikers headed the other way. I always seemed to land on "good luck!" as my parting words with any passer by. 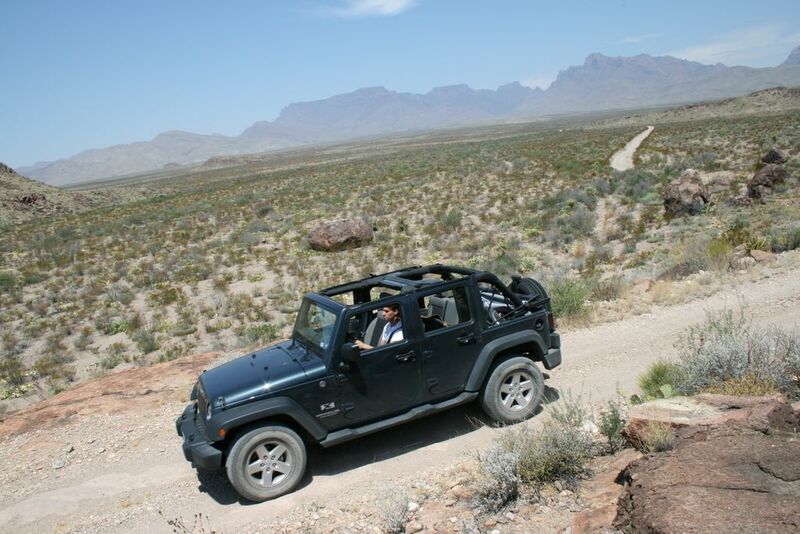 Upon returning, we decided to take the jeep on some of the more interesting (unmaintained) roads. After following some guy in a jeep/bus contraption going five miles an hour, we passed him only to manage a flat tire a little down the road. Nothing was worse than having to stand there next to the flat tire while the guy in his green bus came putting along. He passed us by only to return 20 minutes later to ask if we needed any help. A little baffled at the reaction time of the guy, I politely said no and he putted off back in the direction he just came. By now we had the tire changed out, but the playfully reckless behavior we were previously displaying was no longer an option with the chance of being stuck in the middle of a desert a reality. We poked around the park the rest of the day, trying to stay out of the heat. Temperatures hit as high as 109 according to the temp gauge. As the sun started to set, we finally headed to where we were going to camp. We stopped and inspected a few other sites to make sure we had the best one, but the original seemed to have the best opportunity for a breeze. After getting our new camp set up, we kicked back and had some dinner. As I started to enjoy my rehydrated mashed potatoes and broccoli, the wind picked up and I said, "hope our tent doesn't fly away again". 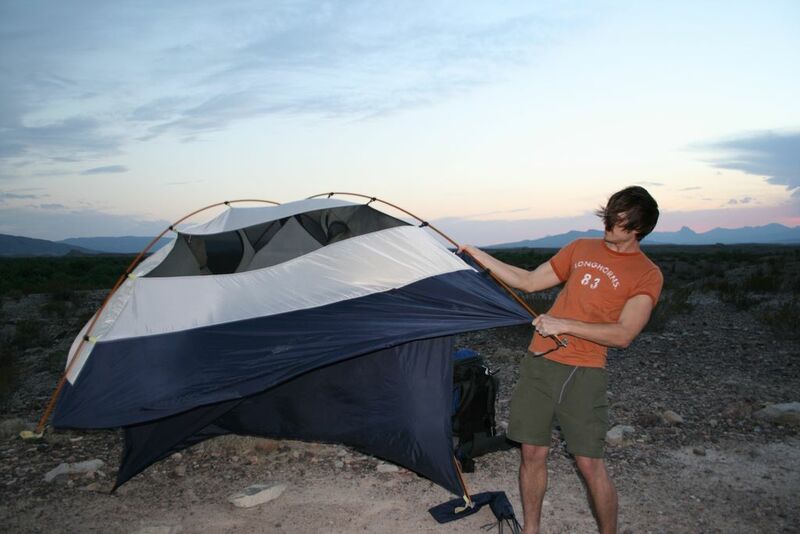 I turned my head in time to watch the wind catch the tent and flip it towards the Rio Grande. I jumped up and chased it through the dark to catch it in time and avoid having to jump into the sewage filled water. I tugged the kite back to it's launch pad and Dale proceeded to use twine to tie it down with 100 pound rocks. You would have thought we would have learned our lesson about tying down the tent after the first night, but evidently not. Despite the strong breeze, it was still hot as hell. After a fairly sleepless night, we were both up before sunrise. We packed up early and were on the road home shortly after 8. It was a lot of fun, but after the heat and dust of the desert, we were ready to call it quits and head home. All in all, a great trip and something everybody should see and experience at least once.